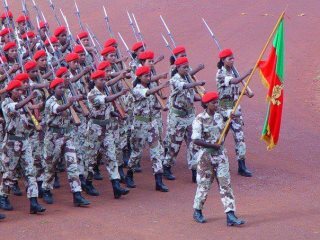 AFRICANGLOBE – Eritrea’s assumption of de facto independence in 1991 and the achievement of de jure recognition as an independent state in 1993, following a popular referendum, brought about a real sense of optimism in the Horn of Africa. It concluded 30 years of bloody struggle. In a sub-region where civil strife, debilitating poverty, famine and backwardness seemed to have become bywords, Eritrea’s independence was regarded as a welcome event heralding a new era of peace, democracy and development. Unfortunately, it took only a few short years before the behaviour of the new state dashed the high hopes of 1993. Internally, it was not long before the Eritrean Peoples’ Liberation Front (EPLF) which was later renamed the Peoples’ Front for Democracy & Justice (PFDJ) banned all other political parties. It rapidly abolished all other possible independent power centres, reaching its apogee after the 1998-2000 Eritrea-Ethiopian war when the President, Isaias Afwerki, ensured the centralisation of his own position and power. Today, Eritrea exhibits autocratic rule under which there is not even a semblance of institutional arrangements to reflect the normal principles of governance. The country has neither a functional legislature nor a constitution. All decision-making is in the hands of the President and the small clique he has put in place around him. Long before this situation became entrenched, there were detailed accounts of the way the PFDJ hunted down former Eritrean Liberation Front (ELF) fighters and stories of forced disappearances, signalling Eritrea’s descent into authoritarianism. From the beginning of independence, Eritrea’s repressive measures against the ELF were accompanied by fiery rhetoric against multiparty democracy. Any euphoria for democracy and freedom visible in 1993 proved short-lived. Eritrea came into being as a small and poor nation facing a daunting task of state building, but from the outset it committed itself with considerable zeal to war and conflict. 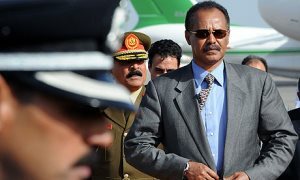 Externally, Eritrea also embarked on a precarious journey of confrontational foreign policies, prioritising military means over diplomacy as an instrument of resolving disputes. Its delusional view of the importance of military activity as a means of resolving disputes was particularly disheartening in a region largely moving towards a more peaceful approach. Within a few years of independence, Eritrea had been at war with Sudan, Yemen, Djibouti and then Ethiopia. Trivialising and berating the United Nations, the African Union and the international order in general, became the hallmark of Eritrea’s foreign policy. After the mid 1990s, and the US refusal to accept Eritrean offers to set up a US base in the country, it consistently tried to project itself as a victim of the international order, and more specifically of US polices, while continuing to carry on with its own abrasive foreign policy. Criticising the US for failing to put pressure on Ethiopia regarding the demarcation of the border while steadfastly refusing to consider any dialogue over the placing of border pillars; and subsequently repeating vitriolic comments against the US, and particularly the Central Intelligence Agency (CIA), which it accused of “bribing” Eritrean youth to flee the country, became the staples of Eritrea’s foreign policy. It portrayed itself as the central element in an illusory world in which it was at war with super-powers, multilateral agencies and almost everybody else. It defined its position as a pariah state: an absolutist autocracy at war with itself, its neighbours and the world at large. The repression manifest in the unending, near slave-labour, national service conscription, led to a massive and continuing exodus of Eritreans including many of the most productive elements of society. From the outset, it seemed as though Eritrea’s confrontational foreign policy was informed by wrong assumptions and by the culture of arrogance the EPLF developed during the armed struggle, a culture taken over by the PFDJ. Central to these attitudes was the misreading of the world order and the shift to a multi-polar world. Eritrea completely misread the diffusion of global power among emerging markets. Stuck in the cold war praxis, Eritrea seems to be nostalgic for the old division of the world into East and West. This was underlined recently when Eritrean officials visiting Crimea, Abkhazia and South Ossetia apparently showed nothing so much as a desire to return to the Soviet era. The motive behind the visit appeared to be an attempt to benefit from supposed differences between the West and the Russian Federation – to return to the old tactic where countries attempted to benefit from pitting the US and USSR against each other. This is the confrontational approach that informs all Eritrean behaviour. Eritrea has been consistent in its behaviour of indulging itself in any matters that might irritate the West. The aim is apparently to try to force the UN to withdraw the sanctions regime imposed on it. However, attaching oneself to groups and countries disliked by the West is hardly the most sensible way to persuade the Western powers to change their mind over sanctions. Indeed, it has only encouraged Eritrea’s isolation. The approach adopted also relates to a second Eritrean assumption: that Eritrea is the most important state in the region and one of vital strategic importance. It is a significant exaggeration. True, Eritrea is strategically located along the Red Sea which is an important sea route connecting Africa and Middle East. Given the serious security situation in which terrorists have freely roamed in both Yemen and Somalia, no one would deny Eritrea’s potential importance in the global war on terror, given that it could be a major pillar of cooperation with the US in the Horn of Africa. Its position is not, however, vital. During the cold war, in the 1950s, it is true that the Kagnew Station in Asmara was of significance for American communications around the world. Things have moved on from the 1950s, however. It seems lost on Eritrea that the technological advances in military communication of the last half a century have relegated its importance to a lower standing. Satellite technology has overturned the former communication links and reduced the geopolitical importance of countries, like Eritrea, to a minimum. This is something that seems to have been ignored by Eritrea’s foreign policymakers and President Isaias himself who still seems to regard Eritrea as a central element in world affairs and of interest to the US and other major powers. As a result of this grossly overrated belief in its strategic importance, Eritrea has even gone to the extent of supporting extremists in Somalia to prove to the West that it cannot afford to be disregarded in the war against terror. This approach seems to owe its origin to the aggression and the “will to power” built up during the long armed struggle. Eritrea’s aggression has hardly been a secret. Its role can be seen in any number of activities contravening international diplomatic norms ranging from the illegal trade in diamonds from the Democratic Republic of the Congo (DRC), to outright support of terrorists in Somalia. Eritrea has been implicated in selling weaponry to Seleka rebels in the Central African Republic (CAR) at the time of the removal of President Francois Bozize and in supporting Houthi rebels in Yemen. It continues to train and harbour rebels from South Sudan, Djibouti, Sudan and Ethiopia, violating sanctions that the UN Security Council (UNSC) has imposed. Indeed, Eritrea seems to have deliberately decided to try to turn the international order upside down by defiance and has persistently shown its zeal in breaking every possible norm of international behaviour. Not many countries would actually agree because there is no evidence of any change in Eritrea’s behaviour in its external relations. Eritrea strongly criticizes the reports of the UN Monitoring Group on Eritrea and Somalia which have detailed its support for extremism in Somalia. It now quotes the Monitoring Group to the effect that it has no evidence of direct Eritrean support for these group in the last year or so. Ironically, the recent highly publicised trip of Ethiopian Satellite Television (ESAT), the propaganda arm of the terrorist group Ginbot-7, journalists to Eritrea portrays a very different view. The programs they produced on Eritrean support and assistance for Ethiopian terrorist and rebel groups based in Eritrea provides very clear evidence of Eritrea’s continuing and unrelenting efforts to destabilise the region. Ironically, ESAT, which is little more than a mouthpiece of Eritrea, has provided the smoking-gun evidence for harbouring Ethiopian rebels and groups openly advocating armed struggle. President Isaias’ misunderstanding of his own, and the country’s importance and of its strategic significance as well as their outdated persistence of a cold war mentality, have all contributed to a seriously faulty reading of the current global political order. Their determination to continue to assume the correctness of their analysis, against all evidence, and the refusal to consider alternatives, means that the only option to persuade both Eritrea and President Isaias is by the firm and full enforcement of the sanctions regime. Unless UN member countries act to ensure the sanction regime is properly effective, it seems that the regime in Asmara remains unprepared to respond. Eritrea may not be as important as its ruler believes, but if we are to achieve peace, security and real development in the Horn of Africa, we do need an Eritrea which is genuinely committed to international norms, is prepared to co-operate with its neighbours and forswear aggression and violence.